Six-Face Sal's Fort is the fourth level of World 4 in the game Yoshi's Island DS. Like all of the fourth levels of worlds in Yoshi's Island DS (and the original Super Mario World 2: Yoshi's Island), it is a fortress type-level with a boss, Six-Face Sal at the end, who is a wooden wheel with six rotating faces on it. It marks the proper introduction of Number Balls, not counting the extra levels. Yoshi must find the Number Balls and throw them at the holder to open up doors and find new areas. Upon defeating Sal and its fort, Yoshi and the babies move on to World 4-5, where Baby Bowser is met. Yoshi starts the level in a castle with some moving platforms and enemies, with a Number Ball nearby. 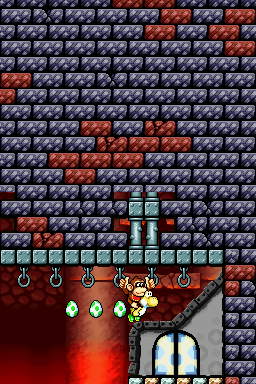 After avoiding some maces and lifting up a crate by standing on a moving platform, Yoshi reaches the next area which starts with a middle ring and three holes for the Number Balls. The player needs to go down to the next area to get the first ball, and then head back and take a moving platform upwards. This transports the Yoshi to an area with the second Number Ball. He must now exit the area and go to the right, where the third Number Ball is eventually found. The player must return to the area with holes, and put each Number Ball into its correspondent hole. This makes a nearby door open. It leads to a moving platform and another door where a Stork Stop and the boss door are found. The door houses Six-Face Sal, who can be defeated by throwing eggs at his pink face. Yoshi can then access the level. This page was last edited on April 15, 2019, at 02:14.